This is one of those completely irrational projects. There were easier pant patterns available after all. 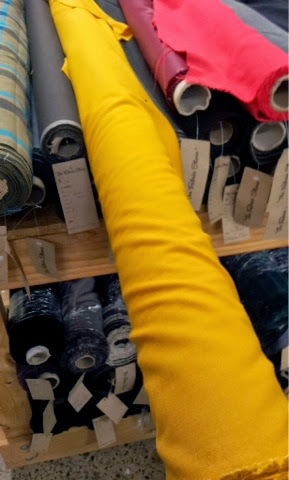 And more sensible coloured fabric. But for some irrational reason I had to have golden yellow wool trousers. 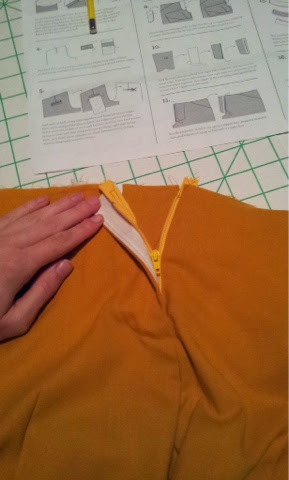 With welt pockets. And a fly front. It was time for my first Thurlows! The role of fabric in Sydney that started it all! I found this beautiful wool fabric in The Fabric Store in Sydney. It only came in this colour which I wouldn’t normally wear (mustard yellow is sooooo NOT my colour, put it near my face and I look like I have jaundice). The longer I looked at it though the more I liked it! Plus this fabric feels amazing. I figured since it’s not up against my face it’s ok to wear and it does match back with a lot of my tops since I wear so much purple, blue and green. 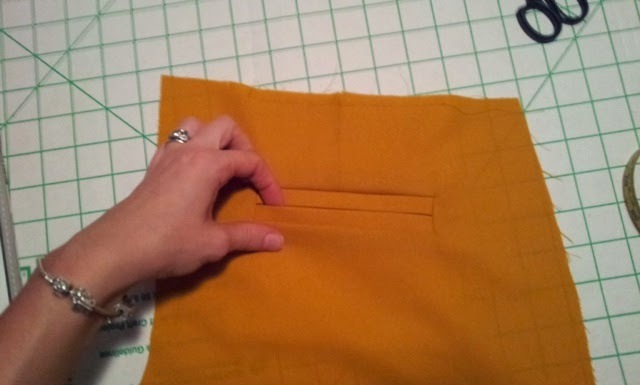 This is seriously the best welt pocket I have ever constructed! I haven’t sewed up the Thurlow pattern from Sewaholic before so a muslin was in order. I tried a size 2 but found it was a little tight across my hips so I made a size 4 up in my good fabric instead. Good thing too, since I ended up needing to open up the centre back seam by about 1cm to 1.5cm to get a good fit in the final pair. Fortunately the pattern is designed for this, and is shaped to fit in at the waist so you don’t end up with pants that fit in the hip but fall down at the waist. I suspect every pair of these I make will need to be basted and fitted at the back seam each time to check the fit before the final sew. It is a small price to pay though, as these are seriously some of the nicest pants I have ever owned, let along made! My first fly front finish – aaaww yeeeaaahh! I used the tutorial for the Thurlow trousers from Lladybird to help me follow the pattern instructions and the extra pictures and notes definitely helped me get such a high quality finish. I think these might be the nicest finished and most complicated pants I’ve ever finished. And I looooove them! Sunshiney pants for rainy days? Yes Please! I originally meant to line them in this gorgeous printed lawn fabric which also had a yellow background but after sewing one pocket perfectly I discovered the wool was more sheer than I had thought and you could see the print completely through the fabric. So I’m saving the crazy lining for when I have a darker fabric to make these up in and I used some basic white poplin from my stash instead. It was great to make a pattern with so many little details that make them look “not-home-made”. These are the sort of pants that people are surprised when you say “I made them” and I love that about this pattern. I skipped adding belt loops – I made them and they were pretty but as soon as I sewed them on they looked tacky and very home-made in the worst way. So I unpicked them and will consider adding them sewn into the waistband seam next time. This whole belt loops thing set me back about a week on hemming these babies but they are finally finished. Excuse the VPL – I was standing in the rain for these pics so speed was of the essence! No time to adjust!! I probably could have made a size 6 given I added another seam allowance to the back seam but I was worried they would be too baggy around the upper thigh and that would ruin the nice tailored look of this pattern. Given the design is made to be altered I’m happy with this fit and will probably use the same size again for future pairs. Oh yes there will be more Thurlow’s in my life – I’m already planning a charcoal suiting pair, a grey herringbone wool pair and some cute green shorts come next Summer. Plus there is the possibility of changing the leg style to skinny and making these up in denim *gasp* could it be TIME FOR ME-MADE JEANS??…. Duh duh daaaaaa! I always swore I would never make jeans since you can buy them so cheap but having lost a little weight now none of my jeans fit and I soooo like the look and feel of these trousers. Hmmm thoughts for the future. It has been cold, wet and rainy all week here but every time I wear these pants I smile because they are so cheery and bright – Do you have any clothing reserved for rainy days just because it makes you so happy?